Home Uncategorized Scratching a Story— BOOK GIVE-AWAY! The medium in which an illustration is executed has an enormous impact on the style and feel of the entire book. Claudia McGehee is an illustrator who works in scratchboard. 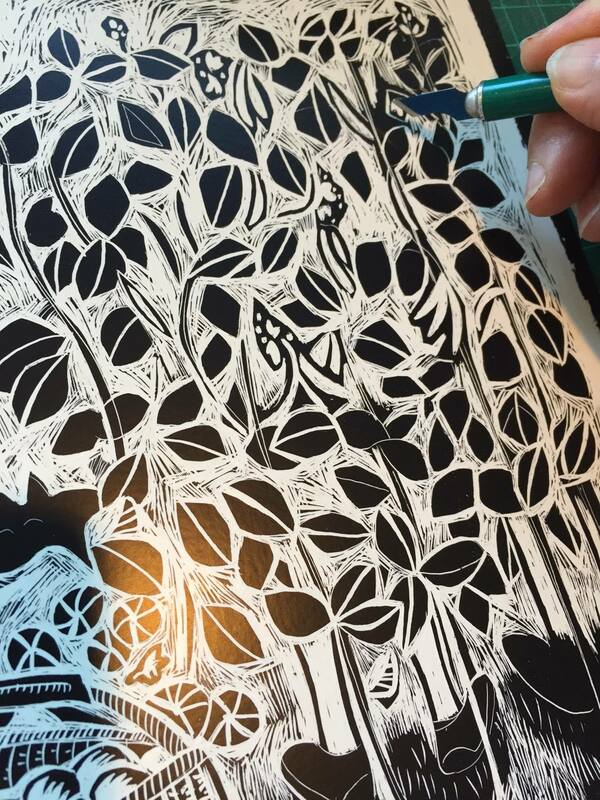 Her finished illustrations have the look of a woodcut, or linocut print, but the process is very different. Claudia begins with a special board, coated with a clay base, covered with black ink. Then, by meticulously scratching with an x-acto knife, Claudia removes the black, working in reverse, and exposing the white under-layer. Then Claudia prints her work onto watercolor paper so she can paint it. 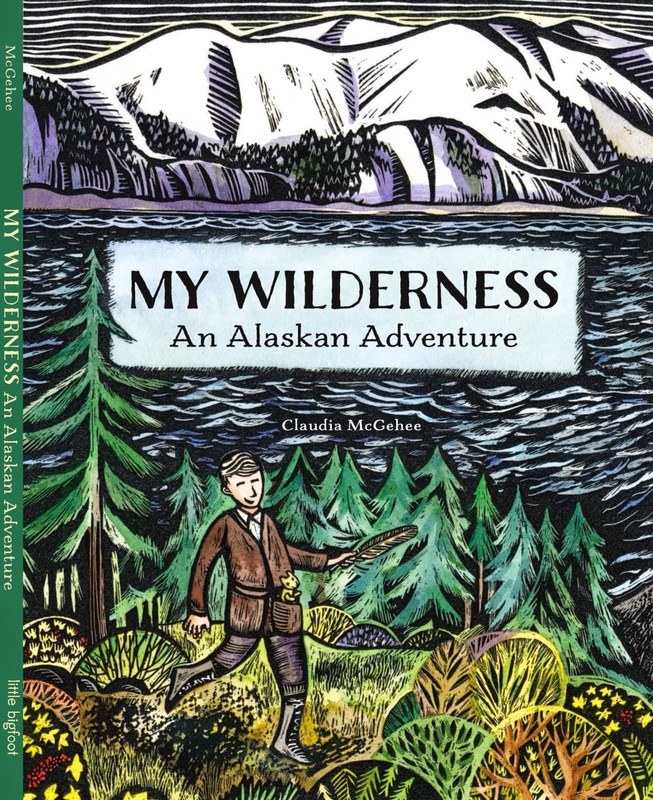 My Wilderness, An Alaskan Adventure both written and illustrated by Claudia McGehee and published by Sasquatch books, has been released this month to rave reviews. Kevan posted on our PBB site earlier about the ownership one feels when you are both the illustrator and the author of a book (.https://picturebookbuilders.com/2015/02/9th-book-first-book-launch/). This made me think about the differences in illustrating your own words compared to someone else’s. So, I asked Claudia if she could answer a few questions and she agreed. Claudia, not only are you both the author and illustrator of this beautiful book, but this story was very near and dear to your heart. Can you tell us a little about why you were drawn to the story and what it was that inspired you to commit to seeing it through to publication (that’s a nice way of me saying, stay with it through thick and thin, researching, revising, editing, sending out, and taking seemingly FOREVER)? American artist Rockwell Kent and his 9-year-old son Rocky’s visit to remote Fox Island, Alaska in 1918 captivated me on several levels. I related to Rockwell Kent (the painter)’s deep inspiration of nature, and his need for some solitude to create art. I also admired the parent-child bond that Kent and his son forged living in such rustic circumstances. I’ve loved how nature seemed to be another character in the story and relished trying to express that visually. I knew the base of the story was a timeless example of the power of nature on people’s lives. It’s a message that lines up with my own personal beliefs. So I researched for a couple years and got my story to a place I could send it out. I tried four different Houses over the years and couldn’t find the right home. I’d put the story away for a while and then be inspired to work on it and try again. Sasquatch was a publisher I’d long admired. 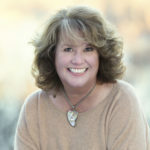 They focus on Pacific Northwest topics and “My Wilderness” clicked for them. My vision of the book complimented my editor’s (Tegan Tigani) well and the whole project was a pleasure to realize. You travelled to Alaska after you had written the story. Did it help you in doing the illustrations? I was finishing final art when I had a chance to travel to Fox Island, the location of the Kent’s historic stay. Confident I had researched as best I could from multiple sources (I had also drawn from childhood trips of Washington state’s coast, similar geographically to this part of Alaska), I still had a nagging feeling. Supposed I had the essence of the place all wrong? That first glimpse of the island from the boat and my fears began to calm down. 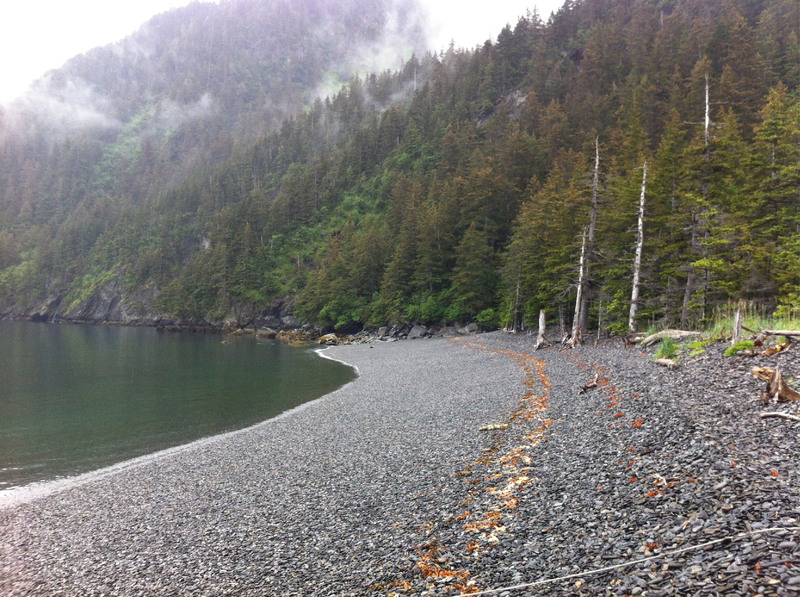 And walking on the island’s beach later that day, I had that rare and satisfying feeling of closure on the project. My work was now done. 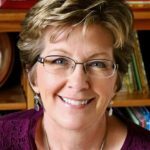 You have both illustrated books that you have written, and illustrated books authored by other people, how do those projects feel different from one another? In illustrating other’s stories, I need time to get to know the setting and characters. It’s well into the sketches before I start talking to them! With my own stories, I know the characters from birth so to speak, so there is a comfort and familiarity there before I even lift a pencil. That doesn’t mean my own words are easier! Like children, some are harder than others to interpret no matter who writes about them! But, to create an entire story directly from heart to head, then hand to paper, is something I am grateful to have the opportunity to do. Obviously you love working in scratchboard. What is it about this unique process that appeals to you and how does it suit your aesthetic? I think it is a very “sensual” medium; very tactile, somewhat audible, and usually bold to behold! The organic line qualities produced by the blade strokes can be precise and “graphic”, or more “painterly” and loose, and I like that freedom. Stark, honest, of nature; these characteristics of scratchboard all fit my work scope well. Here is a wonderful ‘bionic’ version of Claudia’s scratchboard technique. This 2 minute video encapsulates about a half-an hour’s work. I really love learning about the varied mediums that an illustrator chooses to work in and find their creative processes absolutely fascinating. Whether it’s loose watercolor, digital collage, or graphic lines, it really affects the feel of the picture book and the telling of the story. A big “Thank you” to Claudia for sharing her illustrating process with us and introducing us to a beautiful Alaskan Wilderness! In honor of this post being posted on Saint Patty’s Day, perhaps you’ll be the lucky winner of a copy of My Wilderness? Leave a comment below and I’ll pick a random number to choose the winner. I’ll announce the winner when I post next on April 14th— Thanks for visiting! Alaska, Claudia McGehee, Jennifer Black Reinhardt, My Wilderness, Rockwell Kent, Scratchboard. Bookmark. Jennifer, this is such a wonderful post. Congratulations Claudia! Thank you for sharing your process. Love the video. Thank you, Dorothia! And I echo your congrats to Claudia! Jennifer–thanks so much for this wonderful interview! I would LOVE to win a copy of this book! Claudia’s work is just stunning! I actually just purchased one of her scratchboard pieces from her Etsy site, of cedar waxwings with berries, and it’s on its way! I can’t wait to hang it in my study for writing inspiration 🙂 I’m also driven by a connection to nature, and explore it in my nonfiction picture books. Forgot to add that I so enjoyed watching the video too! I am learning how to paint and draw. I love this style. Never heard of it before. Congrats on the book!! Good luck with it. Really would love to win it. Thank you for visiting, Rita! I wish you good luck in the giveaway! Lovely post and art Claudia. 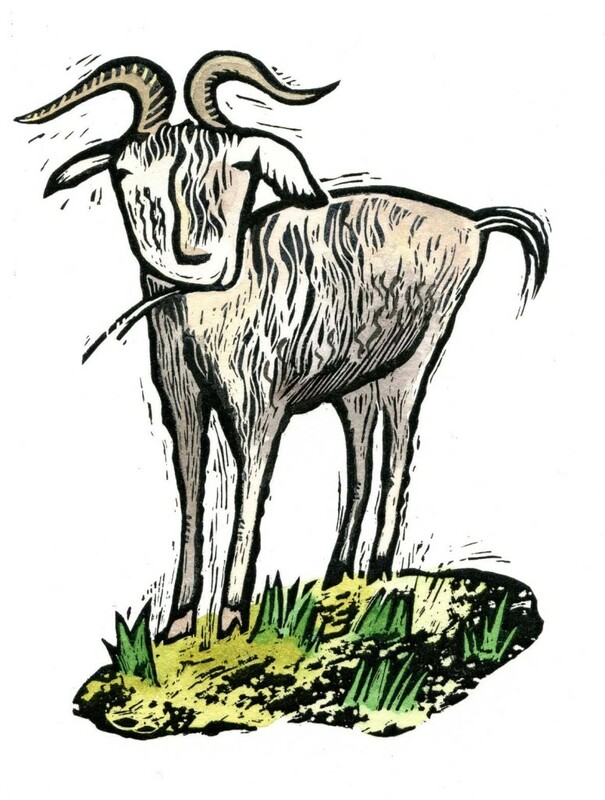 I love the goat! Thanks Jennifer for taking time to share with us. Thank you for visiting, Diane, and taking the time to comment! I loved reading about Claudia’s process, but THAT VIDEO! Wow. I am in awe. Great post, Jennifer. Claudia, your talent astounds me. Stunning work! Reminds me of the Seattle area, too. So gorgeous! Can’t wait to take a look at this book! I love the illustrations- and my parents are going to Alaska this summer. Absolutely wonderful! Thanks to everyone, I’m so happy that you are all enjoying Claudia’s work and learning about her interesting technique. Also— space didn’t allow for me to talk about the fascinating, well-written story as well! Loved that video! Would be fun to “hear” the scratching sounds as well. Amazing work. Can’t wait to read the book. Thanks, Cathy! Yes, it’s a wonderful story! Thanks Cathy! Yes, scratchboard has a very distinct sound. Good idea to incorporate the sound on a video sometime! Thanks for posting about this amazing author/illustrator. The immense amount of time and skill, and dare I say patience that Claudia puts into each page…it’s breathtaking! I know, Linda— I also think working ‘in reverse’ by taking away what will then be the color would hurt my head to do! I have always loved Claudia’s artwork and the artist! One art director from a big publishing house said she loved it, too, and I’ve always hoped that connection would result in a publishing contract. Perhaps it will! Congrats, Claudia, and another step in a solid, dedicated career. Thanks for sharing your friend with us today, Jennifer. Excellent post! Thank you, Connie! Claudia’s definitely a hardworking, talented, busy bee! Claudia! This art is incredible and so very unique. Congratulations and thank you for sharing this! Holy smokes! That video is amazing. Thank you both for including it, and for the great interview. The book looks gorgeous! I am marveling at this video. Such amazing talent, Claudia, and a wonderful story you have brought to life! Requesting the book from my library today. Wow! I am amazed by your process, Claudia. I’m not an artist, so tell me, am I right in thinking that when you scratch away bits of the scratchboard what you leave are the parts that would be shadow? So cool! Thanks for the interview, Jennifer. Thank you all for visiting and for appreciating Claudia’s talent and process. I know she’ll stop by to read all the kind things that you’re saying! Patricia, the part that Claudia scratches away becomes white. And this is the area that would then be colored. So the black lines that she leaves behind actually become the outlines and the shadows. Hard to imagine it, isn’t it? And, hopefully, if Claudia reads this she can elaborate, or correct me if I’m wrong. Thanks for note! Regarding the black bits, nope, they are not usually left as shadow. I treat the black as the line work to be filled in and around with color. I usually watercolor in shadow. But wait, I did use the black as shadow in a couple of illustrations in the book. So yes, sometimes I do! The book looks beautiful. Claudia’s scratch board illustrations add a unique texture to the illustration. I loved the video. I have tried scratch boarding before, the video makes me want to try it again. Oh, that’s wonderful, Ginny! I’m glad it was motivating! What unique and beautiful images! Thanks for sharing your process and journey with this gorgeous book. Thanks for sharing this beautiful post-loved learning more about the process! Thanks so much for this post. It’s wonderful to hear artists talk about their process – and Claudia is one of my favorite artists! That video was a treat to watch! Looks like a wonderful book. Thank you, everyone for stopping by and sharing your comments. Good luck in the book give-away! Thanks for sharing this beautiful book! I love the video, too. Would love a copy of ur beautifully written and illustrated Alaskan Wilderness book. Love ur artwork! Pick me ! Pick me! Yay for Claudia’s beautiful book! I’ll have her pick a random number the night before my next post (April 14) and I’ll do some counting! Good luck to all of you! Jennifer: Thank you for sharing this post about a lovely book. The illustrations by Claudia McGehee are beautiful and breathtaking. I enjoy painting in acrylics and watercolors. Thank you for sharing the medium that you use and your creative process. I loved watching that video. What a beautiful process, Claudia! Thank you for sharing, Jennifer. The book looks great. 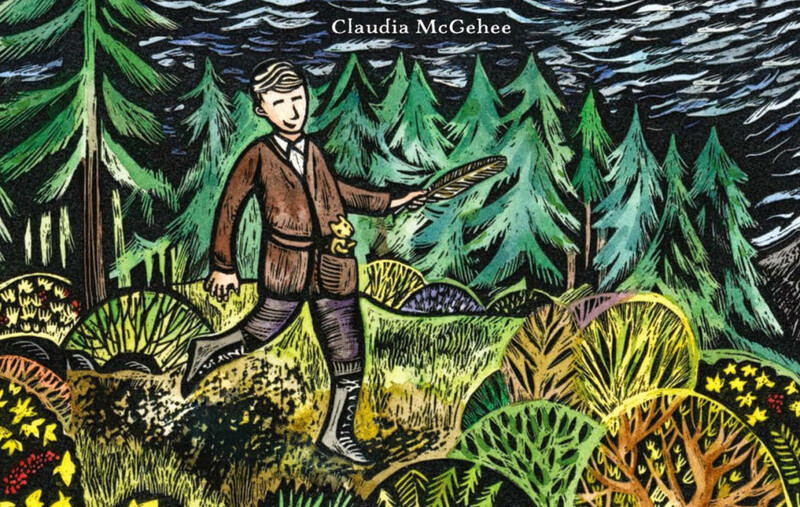 I am so glad to see another book being authored and illustrated by Claudia McGehee. I have bought her other books and was thrilled by her attention to detail and love of nature. The children I gifted these books to have enjoyed them immensely. Thanks for your art and best wishes on your book. Hi Merry, and to all Claudia’s fans, thank you so much for taking the time to comment. You’ll be happy to know that Claudia is right this minute finishing up final artwork for another book! I love Claudia’s work, and enjoyed this insight into her process. Claudia, the depth and strength remind me of British Columbia, not surprising since it’s a neighbor? Elegant, sharp, commanding! Thank you, Jennifer.for the opportunity. Thank you all for your time, attention, and kind words! Thanks for the lovely review Phyllis! What a fascinating post. I will have to share this with my granddaughter, especially the video. I love the artwork in this book Thanks for this wonderful post. 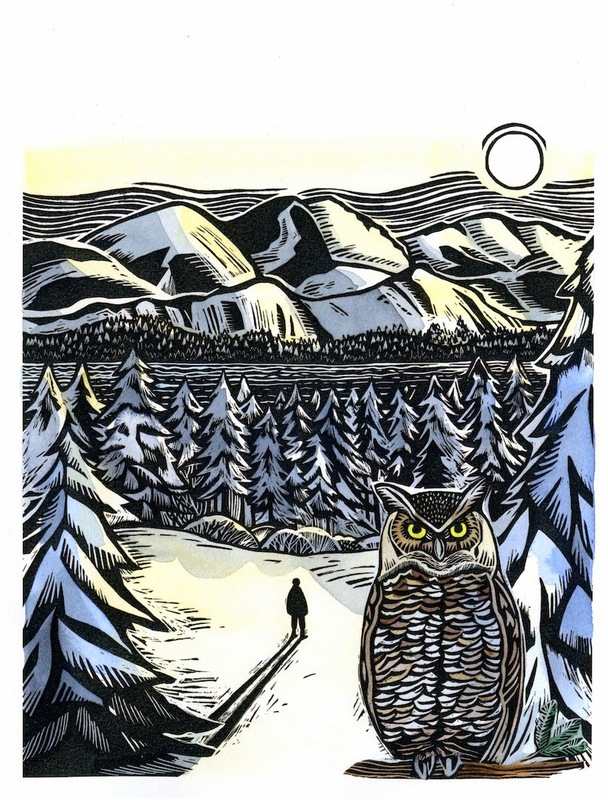 I can’t take my eyes off the owl and the evergreens. Beyond-the-beyonds lovely! That image has a lot of depth, doesn’t it? Love it, too! Thank you, Kathy! Loved reading all about this PB, and watching the fabulous video! If I should win the giveaway, please write a note inside to Little Free Library Walnut and I will share with others! You’re awesome, Nicole! Thank you so much! I still remember scratch art as being one of my favorite art activities to do as a child and now I’m in awe of Claudia’s talent. Amazing, and holy cow, that video is fascinating! I imagine Claudia must have some tired hand muscles at the end of finishing a book! Thanks, everyone for taking the time to visit PictureBookBuilders! I can’t believe how much time is spent on illustrations in general, much less the ones done with this method. What a display of true dedication and a love of art! Thank you so much! I enjoyed the video also. i love Claudia’s art! I own several of her prints and I buy her books for my nieces and nephews (and myself). This book looks wonderful. I loved reading about her process! Thanks. Thanks so much, everyone! We’ll wait until my next post in April to announce the winner of a copy of My Wilderness. Thank you to all of you who paid us a visit! Wow! Jennifer said you were a generous and passionate group of followers and now I believe it! Thank you all for the kind words and the chance to share about my work. Scratchboard is a cool medium and I reccomend it to parents and educators and artists alike, for all its unique qualities. Kids and adults always seem to find the results very satisfying, and fun! Scratchboard can be found online. I buy it through Jerry’s Artorama. There is a student grade that can be used without an xacto blade for younger children. I am a bit Scratchboarded it out tonight. Too much of a good thing when you are at the end of a book project! (I have a very in-shape right wrist at the moment!) But your words here today have lifted my spirits. I appreciate it much. If there were any individual questions, I’ll try and answer them here when I indulge in this comment page a little more tomorrow. And I’ll enjoy inscribing the winning book! 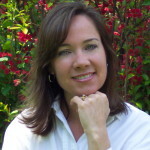 Jennifer, thank you for fielding comments today and the invitation to share on this blog! (Jennifer is my life-line on book projects, always sending out encouraging texts!) Good night! Such gorgeous artwork! I haven’t done scratchboard since high school, but I love lino block prints. Maybe I’ll have to give scratch board a try again one of these days! Oooh. The scratch board is such a perfect medium for Claudia’s style. I love the way she composes her pictures. The image with the owl in the foreground, the silhouetted figure, and the full moon reaching beyond the frame…I’m transported. Can’t wait to show this book to my young daughters and tell them how it was made. (They love playing with scratch art sets.) I think it will pique their artistic interests. This was AWESOME, Jennifer! I could sit and watch that time lapse video all day long. Thank you for putting together such a great post. I can’t wait to see this book! I love Claudia’s work! Her style of illustration in perfect for a story about Rockwell Kent. Can’t wait to see the book. I have been a fan of her work for years. This form of artistry is just beautiful. I absolutely love this! Great post. Thanks so much for sharing. Thank you, everyone, and thanks again to Claudia for sharing her story and her process! Love the scratchboard technique! So gorgeous. Plan to share the video with my students–thank you for helping them to understand this approach, and for sharing your work! Wonderful post! And I loved seeing Claudia’s scratchboard technique bring a magpie to life in the video. What an amazing talent! Claudia does such great art. I have admired her work for a long time. I post her art and yours on the Muscatine Art Center Facebook page frequently. Thanks for being such a great supporter of your fellow artists! Thank YOU so much, Lynn, for being such a wonderful supporter of all of us!!!! And thank you for visiting and commenting on our blog! Thank you! This is a fascinating technique. The video was great! I love to write, but I can’t draw good stick figures. Congratulations on writing and illustrating your new book. That video is awesome! Thanks for sharing your technique. Anyone who knows someone who bailed to Florida should send them a copy. Claudia’s illustrations are wonderful – can’t wait to read the book. Thanks so much for this. I’ve admired your technique for some time and wondered how this was done. The video made it so clear…except for one thing. This was a black and white picture, but the text says that for color you transfer the image to watercolor paper and then paint. How do you transfer it? Run a roller with black ink over the finished scratchboard art and then “print” it onto the watercolor paper, or….? Anyway, I do love your art and look forward to seeing this book. Hi Colleen, I know Claudia wants to come back and reply, but I think I can at least address your question in the interim. Yes, Claudia is left with a black and white board. She scans it into the computer and either has a professional printer prints it out on watercolor paper (for large pieces), or she does it herself. Then she paints it once the black and white image is on the watercolor paper. I hope I have that correct and I hope I answered your question. Thanks for visiting! Hi Colleen- Jennifer’s answer is very good. I color a scanned print of my black and white scratchboard work with tradiotional watercolor methods. Thanks so much, Jennifer and Claudia. I love knowing how those beautiful pictures are made as I read a book. I happened on Claudia’s work some months ago and have been sharing it around ever since. The texture of Scratchboard combined with Claudia’s colors are so inspiring and lovely. Thanks for sharing, and especially for the process video. Love it! Thank you all so much for your thoughtful comments and for stopping by our blog! I love Claudia’s work!! I had a chance to meet her a couple years ago in Seattle at a conference and she is engaging as her art. She is also the only artist who I let be a guest illustrator on my October Monster-A-Day. Can’t wait to find this book. Hi Kevan— love your bunny ears! Your post gave me the idea to do this post on Claudia’s book. I was really moved by your pride as author/illustrator comments and mentioned your book/post when I was asking her to participate. She spoke very kindly of you and how much she enjoyed meeting you in Seattle! Kevan was a warm and welcoming presence at the SCWBI WA I attended a couple years ago. Illustrator extraordinaire, he is also one of very few who can pull off bunny ears with much panache. This was a spectacular experience. Thank you both. The video helped me to really appreciate the scratchboard technique. Please include me in the book giveaway drawing. I love this form of illustration and it was such a treat to see the process. I can’t wait to read this book! These illustrations are amazing. I know my family would enjoy this book too. All of Claudia’s work is gorgeous!!! What a beautiful book. My son would love this book. I love working in scratchboard, but haven’t done so in a long time. This is inspiring me to pull out my stuff and play! Thank you, everyone for taking the time to read and reply! I’m impressed that perhaps Claudia’s beautiful artwork and technique has inspired some closet scratch boarders to scratch away! That’s fascinating to watch. Beautiful images and looks like a wonderful book. My library has several Sasquatch books, so I’ll see if they have this one. I love Claudia’s book already and very happy to see some behind the scenes work. Nice work! Thanks Mark!Glad to make acquaintence with your writings as well, fellow Sasquatchian. And again, thank you to Jennifer for this post! I’ve thoroughly enjoyed reading through all the comments. Please feel free to contact me through my website or email if you have any further questions or comments about scratchboard or any thing else! LOL…I don’t know so much about~ bionic video~, maybe Swartzevideo or Speedy Gonzalez arts vid, or even Turbo vid. It’s not an Austrian bird or a snail so it must be a Spanish bird… awesome video and thanks for sharing. Its works a treat, love the stylised yet detailed finish, it allows the imagination to play. Thanks again. I can’t wait to see this book–I just ordered it at my library. I’m a Pacific Northwestern girl and I love books from artists in the northwest, for they always get the angles of the sun just right! I’ve bought several books just because, and found out later they were done in the pacific northwest. I just completed a review on Sequoia, which I loved, but I wished it had been a tree in the Pacific Northwest. Then the book and I it would have been complete. And thanks, Claudia, for sharing your art process. I’m so intrigued how artists get their work done, and shocked at how many stages they pass through to get to the end product. Thanks, Jennifer, for letting me know about a book I’m about to love! And thanks Susan- like lots of other jobs in life, not many see the hours behind the finished pieces. And yes, I agree on PNW light- very special, steeped in green. Thanks Kalil and Jenna, too! You didn’t mention the texture of its pages. I just sat and passed my hand over them to enjoy the ‘feel’ of the pages. Lovely. They rarely use such good paper for books any more. Sigh. Thanks Susan and Christine. And Susan, I loved the paper, too and thanks for noticing. Good paper is part of my experience of good reading!